PMM has teamed up with JLM to give readers the chance to win a fantastic professional DPF Cleaning Toolkit and Clean & Flush pack. Kalimex, the UK distributor for JLM Lubricants, is celebrating the continued success of the professional DPF Cleaning Toolkit and Clean & Flush pack. Designed specifically for use by technicians, JLM claims that the kit will clean and revive a clogged DPF in around one hour. The powerful clean and flush fluids will quickly break down trapped carbon allowing a regeneration to take place. This means that there is no need to remove the DPF or send it away for costly off site cleaning. The latter is of course a lower cost option, albeit still in the region of £200 to £300, or more. But more importantly, the vehicle remains off the road for a day or two at least while the DPF is being cleaned and returned. 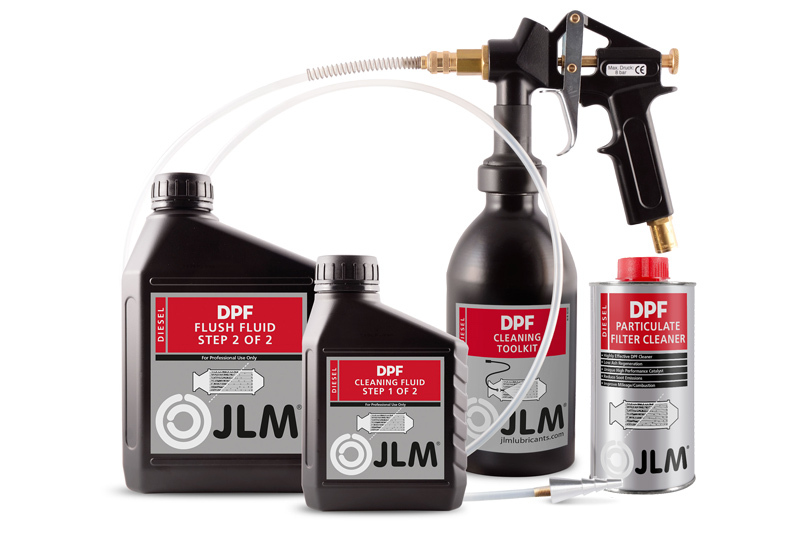 The Professional DPF Cleaning Toolkit from JLM Lubricants offers a solution that will enable any workshop to clean and flush a blocked DPF in just one hour. This means that a vehicle can be quickly put back on the road with minimum disruption to the customer. To the workshop, this equates to a valuable additional service offering to help deal with a growing problem associated with low mileage or urban cycle diesel engines. The kit includes a powerful cleaning fluid; a flushing solution to remove any contamination, and a dedicated application toolkit. Roughly how many hours will it take for the kit to clean and revive a clogged DPF? Deadline for entries is 10/06/2019. T&Cs apply. See website for details. Deadline for entries is 10/06/2019. This competition is run in association with JLM and open to trade only. For further information from JLM, click here.